IS ANY IDENTIFICATION NEEDED FOR JACK BENNY, EDGAR BERGEN AND EDDIE CANTOR? Sunday was the most popular night for listening during Network Radio’s Golden Age. Over the years its schedule was loaded with Hall of Fame greats like Jack Benny, Edgar Bergen and Eddie Cantor. It was also the night for spectacular failures like The Big Show and Radio Hall of Fame plus several short-lived wonders that either fell from favor, (Stop The Music, for example), or moved on to other nights, (Major Bowes’ Original Amateur Hour). 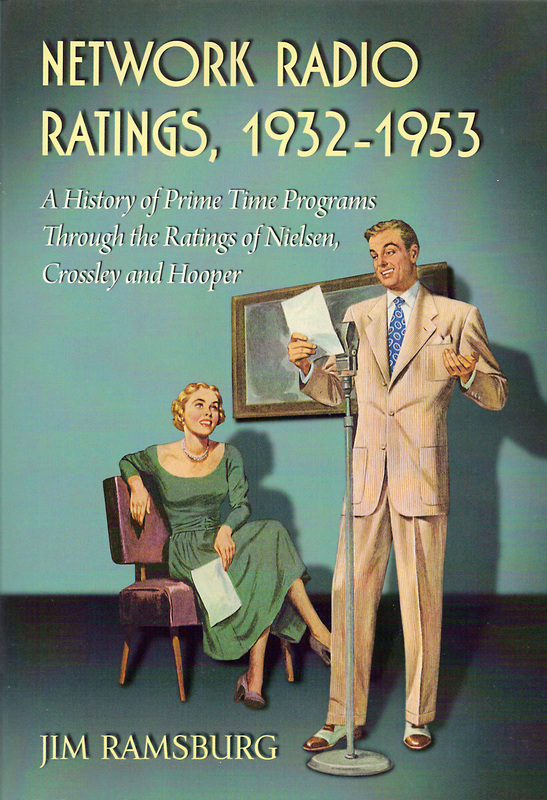 Network Radio Ratings, 1932-1953 reports that 17 programs and personalities registered at least three seasons in Sunday’s Top Ten over the 21 years of the Golden Age. . Listed below are all 17 in alphabetical order. Here’s your challenge: Create a list of Sunday’s All Time Top Ten in order of their popularity. To help with your list we’ve added the total number of Sunday Top Ten seasons that each of these attractions scored during the Golden Age. If you think that all you need do is rank them by their number of Top Ten seasons, think again. It’s not that easy and there’s a fooler or two in the mix that are sure to surprise you. Have fun building your All Time Top Ten list of Sunday’s favorites. Look below the book cover and you'll find the answers. 4/ Phil Baker's strong finish began with his three season run on Gulf Headliners in the 1930's and continued the next decade with his comedy quiz Take It Or Leave It, all resulting in 62 points. 5/ Eddie Cantor was Sunday's first superstar with three first place finishes from 1932 to 1935. He added a fourth and second place before leaving Sunday nights in 1937. Cantor returned to host Take It Or Leave It in 1949 with so-so ratings. His Sunday total was 49 points but he moved on to find greater success on Wednesdays. 8/ Fitch Bandwagon capitalized on the popularity of the big bands to score eight consecutive seasons in Sunday's Top Ten from 1938 to 1946 for 40 points. 9/ One Man's Family enjoyed six straight Sunday night Top Ten seasons before it was shuffled off to Blue and then NBC's Sunday afternoon lineup. The Carleton E. Morse drama registered 35 points in Sunday prime time. The rest of the candidates for Sunday's All Time Top Ten were: American Album of Familiar Music - 26 points; Phil Harris & Alice Faye - 26 points; Our Miss Brooks - 21 points; The Great Gildersleeve - 19 points; Horace Heidt's Youth Opportunity Program - 15 points; Blondie - 12 points, and Theater Guild On The Air - 10 points.